Let’s face it. We all know we’re in trouble. Last year was one of the hottest years on record, and 2015 looks to be worse. In that context, being reminded that we will run out of fossil fuels might sound like good news. But it’s more complicated than that. Richard Heinberg’s “Afterburn” — despite being a collection of talks and essays — lays out in lucid, reasonable and understandable detail the consequences of the convergence of two coming crises: the environmental disaster of increasing carbon dioxide in the atmosphere and the less-acknowledged fact that we’re on the verge of running out of cheap, easy sources of fossil fuel energy. Note that Heinberg doesn’t say we’re running out of fossil fuel. The media has recently been full of the assertion that we’re not running out of oil because we’ve found new sources and new fields. All that will happen, they say, is that the price may go up. But, as Heinberg points out, what we’re approaching is the point where the energy invested in extracting fossil fuel is so high that it approximates the energy gained from that fuel. When that happens, it won’t matter how high the price goes up. 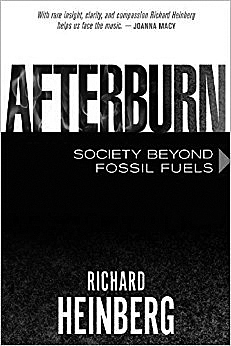 “Afterburn: Society Beyond Fossil Fuels” by Richard Heinberg. No matter how profitable it is, when the energy cost of fossil fuel approaches the energy benefit, it’s an unsustainable situation. Before we get to that point, though, the cost of energy will increasingly drag on the economy as the long-term average price of fuel goes up. That will make it more difficult to deal with the other problem: global warming. Heinberg says a window of opportunity is closing. We won’t be able to use fossil fuels to develop means to rebuild our economy based on renewable energy. This is especially true because of the delay in transitioning away from fossil fuels, due to global-warming denial and the inertia of energy companies. Heinberg says fossil fuels have some unique characteristics, not easily replaceable by wind, solar or even nuclear power. First, the energy in the fuel is easily transportable and easy to store, such as in your gas tank or in tank farms. Second, the renewable energy tends to be from sources that are intermittent. He suggests it is unlikely that wind or solar power can ever be stored as efficiently — say, in batteries — and used for goods transport and air travel in the way we use gasoline. The consequence is not that we need to give up on alternative energy — in fact, even if global warming weren’t a consequence, sooner or later we would run out of cheap fossil fuels. But it means that efforts to simply replace petroleum and coal power with solar and wind power, without changing our underlying transport and power systems, will be insufficient. The infrastructure of our civilization needs to change. Battery operations may work for small private automobiles, but they’re not very useful for large trucks or airplanes. Shipping costs will inevitably rise, meaning that local economies need to be revived. Energy efficiency will have to come to the fore. This means that prosperity, as we’ve defined it in the 20th and 21st centuries, is coming to an end, especially in the industrialized nations. A world economy based on ever-increasing material consumption will be impossible. Much of our material prosperity is based on cheap energy. As energy becomes more expensive, and as we fulfill a moral obligation to stop stripping resources from the less developed world, we’re going to have to search for other forms of success aside from material prosperity. He lays out his points clearly, with little rhetoric and with more than a shade of criticism for environmentalists who suggest that we can keep living the way we’ve been living but just substituting renewable energy for fossil fuels. Economic growth, he says, is at an end. The real question is whether we can mobilize the political force to make the transition while we still have the resources to develop the machinery, the techniques and the social institutions that will allow us to restructure the economy, and the transport system without a massive crisis of hunger, deprivation and chaos. Reprinted from Street Roots' sister paper Real Change News in Seattle, Wash.